Yes, we have a Social Quarters room! After several years, ER Pickett re-opened the Social Quarters. You can play chess, checkers, chutes and ladders, watch tv, listen to music or if you are into cards you can play a rousing game of solitaire. Seriously, gambling is not permitted by State law, nor endorsed by the Santa Monica Elks, but I am sure there are plenty of other things we could find to do in there. We need a shuffleboard champ! 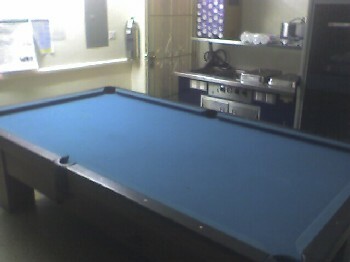 We have a pool table . Come and challenge a game to a fellow member. 906 has participated in the Santa Monica and Palisades Parade on the 4th of July. In the Americanism corner case can be found trophies from parades and from the VA. There are other artifacts in the case of interest. A special piece of artwork by Darren Brenner is displayed. Darren did the work for the 2004-05 Americanism Day. Rememberance Flags and Elk Coffin flags are displayed.